These days, companion planting and intercropping (or polycultures) are buzz words for organic gardeners. Intercropping refers to the practice of growing two or more crops close to one another in order to produce a greater yield on a given piece of land by using resources that would otherwise not be utilized by a single crop. So, for example, gardeners might plant deep-rooted crops alongside crops with shallow roots so that plants do not compete for water and can access nutrients at different soil depths. Alternatively, gardeners might plant a tall crop alongside light-sensitive crops that require partial shade or alongside climbing crops that require structural support. Companion planting is in many ways another word for intercropping and refers to the practice of grouping plants together to enhance each plant’s growth and protect crops from pests. Examples of companion planting include placing marigolds alongside vegetable crops in order to attract beneficial insects and planting borage near tomato plants to repel tomato worms. Both of these cultivation practices appeal to organic gardeners, for when done properly, they increase garden yields, build the soil, repress weeds, and provide habitat for pollinators as well as beneficial insects that keep pest populations under control, all without the addition of artificial fertilizer or pesticides and without additional labor. Indeed, companion planting and intercropping often reduce labor by decreasing the amount of time spent on weeding and pest control. Given the growing popularity of these cultivation techniques, it would be easy to think that they are relatively new developments. In fact, they are ancient practices used by indigenous people all over the world. One such practice, called the Three Sisters, has been used for generations by Native Americans throughout North America. This planting method involves intercropping corn, beans and squash. First, corn is planted in well-fertilized mounds. Once the corn is four inches tall, beans are planted at the base of each stalk and squash is planted nearby. The corn provides a structure for the beans to climb, eliminating the need for poles or trellises. The beans add nitrogen to the soil, making this important nutrient available to the corn and squash. Meanwhile, the squash shades the soil, reducing evaporation and repressing weeds. After harvest, the large amount of crop residue from this planting combination is incorporated back into the soil, building up organic matter and improving soil structure. In addition to maximizing crop yields, the Three Sisters provide a nutritious harvest. Corn is a source of carbohydrates, dried beans are rich in protein, and squash yields vitamins from the fruit as well as healthy oil from the seeds. Native Americans lived and continue to live off these three staple crops, and they adapted their planting techniques to their specific regions. The Iroquois lived in wet, cold climates and planted in mounds to improve drainage and soil warmth, whereas the Anasazi who lived in the Southwest adopted their gardens for a drier environment by planting in beds with soil raised around the edges, so that water would collect in the beds. They and other Southwestern tribes also include a “fourth sister,” known as the "Rocky Mountain bee plant," which attracts bees, helping pollinate the beans and squash. The Three Sisters planting technique is ideal for Central Texas, where soils benefit from nitrogen and mulch. March and April are the best time to plant the Three Sisters, but if you missed the spring planting season, you can sow a modified version of the Three Sisters now. 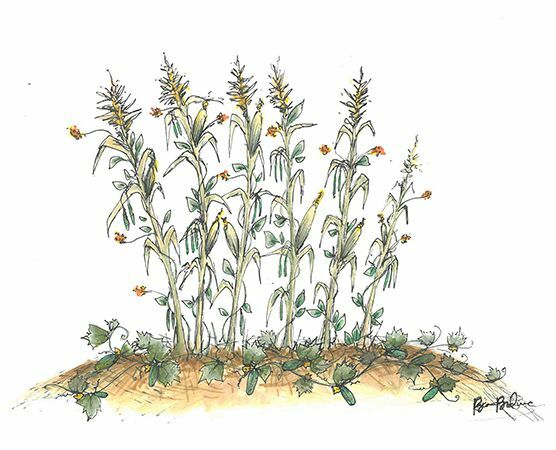 From mid-July through early August, Central Texas gardeners can plant corn. In late August, we can plant lima beans or snap beans. Instead of winter squash, which much be sown by late July in order to ripen by fall, we can intersperse our corn and beans with cucumbers. While timely, this planting window is small, so if you would like try your hand at growing this modified Three Sisters, prepare your beds and get planting now! Below is a basic guide to this companion planting technique. Choose a site with full sun. Weed your garden bed and if necessary, amend the soil with a 2-3 inch-layer of compost and/or aged manure. Edge your bed with a rim of raised soil so that water collects in the bed. Make multiple rows of corn/bean mounds. The center of each mound should be five feet away from the center of the next. Each mound should be 18-inches across with flattened tops. The mounds should be staggered in adjacent rows to ensure adequate pollination of corn plants. Note: A 10 x 10 foot square of space for your Three Sisters garden is the minimum area needed to ensure good corn pollination. Once your corn plants are four inches tall, weed your bed then plant bean seeds at the base of each corn stalk, leaving about three inches of space. Build your cucumber mounds in each row between each corn/bean mound. Make them the same size as the corn/bean mounds. Plant three cucumber seeds, four inches apart, in a triangle in the middle of each mound. When the cucumber seedlings emerge, thin them to two plants per mound. Weed at intervals as needed.